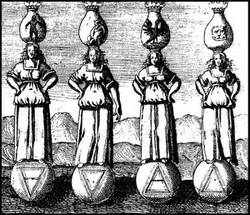 The four pillars of Gnosis are the foundations of the Gnostic knowledge- they are Art, Science, Philosophy and Mysticism. Knowledge and wisdom are cultivated through the intelligent combination of these areas of study within us- they are a medium of expression for the consciousness itself. Art is the world of the imagination and of inspiration. The esoteric art has always expressed the internal, mystical reality of a person. This is referred to as the “Royal Art of Nature”. It provides direct teachings to the consciousness of a person who is receptive to them and is a type of food for the soul that is perceived through the imagination and illuminates the heart. Psychology: the functions of the mind, the subconscious. Kabbalah: the internal dimensions of nature, the astral world. Alchemy: working with and developing our internal energies, transformation. There are also other areas such as the tarot, astrology, chakras, meditation etc. They are mystical sciences for us to study and verify in our own way. Philosophy is the love (Philo) of wisdom (Sophia). It is about the questions to our very existence- who are we, why are we here and where are we going? Gnosis is a living philosophy where we allow the inner questions, the spiritual impulses, to direct our questions and our search for knowledge. This is what constitutes the Initiatic Philosophy- learning to comprehend and develop the path of self realisation within our own life. Mysticism is the direct experience that illuminates the consciousness and is in fact the one that completes all the other pillars. Gnosis itself is a mystical study and therefore meditation forms a large part of our studies. Mysticism also includes working with our dreams and learning to perceive and strengthen the connection we have to our own internal Being. It is a practical study where an effort is directed to allowing the consciousness to experience the inner nature of things beyond the mind, body and emotions. For more information about our Esoteric Comparative Theology Course to become a Gnostic Priest or Priestess please see the Church Site.